Manali Patel is launching her own brand, No Rivals. Photos by Adam Cvik. Walking around campus, you can see many trends amongst students. Our Dawgs With Style stand out from the average college student fashion trends. Manali Patel, a senior entrepreneurship and innovation major, has used her style and love for fashion to launch her own brand, No Rivals. The Butler Collegian: Who or what do you credit for influencing your personal style? 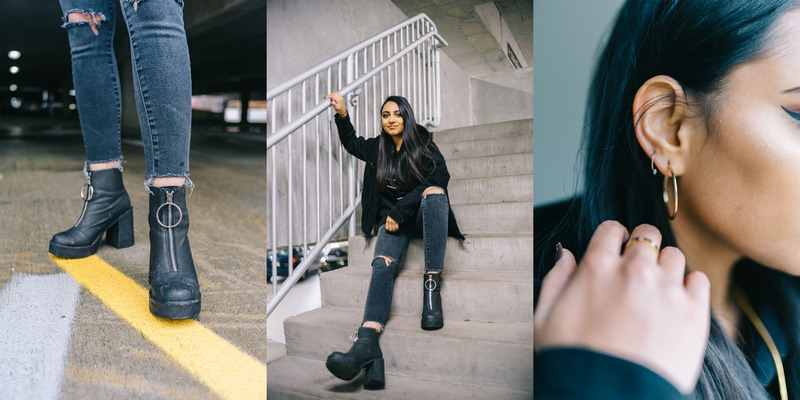 Manali Patel: I credit my younger siblings for influencing my style. In high school, my brother flipped sneakers for a living and exposed me to the urban apparel market. My sister has always worn super dark colors which explains why everything I wear is dark. TBC: How would you describe your style? MP: I would say my style is comfy-chic. I love t-shirts and hoodies. My style is pretty edgy too. Most of my wardrobe consists of dark colors. Probably 90 percent of it is black. If I show up to an event or something dressed in a color, my friends will notice and ask me what the occasion is. TBC: Has your style changed over time, or has it pretty much stayed the same? MP: When I was younger, I was into super girly stuff and always wore pink or purple and lots of sparkles. When I was in high school, I dressed sort of preppy –– my worst nightmare now. I would wear collared shirts with those big necklaces, not a good look for me. I feel like the style I have now is going to be consistent for a while. I always feel comfortable in what I wear and my style today has given me the passion that I have for the fashion industry. TBC: Now onto your brand, what made you want to start it and how long have you been planning it? MP: My cousin, Maya, and I have always wanted to start some sort of brand of our own. We didn’t really think it would ever happen, but with the support of our family and friends, we felt encouraged to do it. I have been planning No Rivals since February. That is when Maya and I discussed the name and began our research on the streetwear industry. TBC: What role do you play in it? MP: I am the Founder and CEO. I have done all the work for No Rivals up to this point on my own. Maya helped initially with the name, but since then, No Rivals has been worked on by me. TBC: How does your personal style reflect into your brand? MP: Anyone who knows me knows that No Rivals is a perfect depiction of my style. The two first items of No Rivals are simple yet very cool. The items are also amazing quality. The fit is mimicked off of an oversized Vetements hoodie that I have that I wear at least once every week because I am so in love with it. The items in the brand fit that idea of presenting a high-end look while being comfortable. TBC: What designers, other brands, and influencers have influenced your style and your brand? MP: Supreme has influenced my marketing strategy 100 percent. The use of their limited marketing model is what has turned Supreme into the badass streetwear company it is today. The last-minute and limited drops are what builds demand for their product. Researching this type of marketing model influenced my own. I have also closely followed Virgil Abloh and his brand Off—White. He has amazing concepts. Vetements influenced the fitting of my items. TBC: Where do you see your brand going? What are your short term and long term goals? MP: Right now, I am just using it as a learning experience. I am actually doing it as an internship and counting it for credit within the Lacy School of Business. I just want to see how successful I am at creating brand awareness. Once I begin selling, that is when I will start to understand where I see No Rivals going in the future. For the short term, I am just trying to get it launched and making sure I am able to breakeven on my loan. TBC: How did you come up with the name “No Rivals”? MP: Maya ran across it in a Dazed and Confused Magazine and out of curiosity looked it up. We saw it had no trademark associated with it so we filed the trademark for it right away and built a purpose with it. TBC: What is your favorite piece in your closet? MP: 100% my drop shoulder black Vetements hoodie that I kept mentioning earlier. I would die without it. TBC: What are 3 must have items in your closet? TBC: What are your favorite fashion accounts on Instagram? This can be a brand, influencer, or creative account. Manali is wearing a Topshop denim jacket, a Raf Simons hoodie, Urban Outfitters jeans, and Dolls Kill booties.